For immediate assistance getting the information you need, trust our professional staff to guide you through your senior service options. All of our communities and services are listed here. Use the color code below to learn what each community on the right has to offer. If you are unsure of which service you need, our Eskaton team members can help point you in the right direction. Just give us a call! Independent Living: Eskaton offers an independent lifestyle along with the convenience and assurance of support. Residents can choose from hospitality-style amenities, housekeeping and transportation services. Assisted Living: Eskaton assisted living provides enhanced personalized assistance with activities of daily living in the comfort of the resident’s apartment. A full spectrum of convenient services, including fine dining, recreation and cultural pursuits assures an engaging life. Short-term (respite) stays are available. Memory Care: Eskaton's Memory Care and Pre-Memory Care are designed to support the well-being of persons living with cognitive change. Our Dawn of a New Day program supports the whole-person and promotes self-expression, empowerment and mutual respect. Short-Term Stays: Two weeks or more are available at multiple Eskaton communities. Often a welcome and healthy option within the family caregivers’ support system, these temporary or transitional stays also offer guests the opportunity to experience the comprehensive services, amenities and life enrichment programs enjoyed by residents. Available services vary, depending on level of care, but all include nutritious meals, around-the-clock staffing and engaging social interaction. Rehabilitation and Skilled Nursing: Eskaton rehabilitation offers 24/7 nursing support combined with physical, occupational and speech therapies. Eskaton long-term care provides 24/7 skilled nursing care and assistance with activities of daily living. Residents are encouraged to participate in recreational and social activities to support their independence whenever possible. In 2013, more than 80% of Eskaton Care Center residents returned home or were discharged to a lower level of care. Affordable Housing: For older adults with limited incomes, rental assistance is available through the U.S. Department of Housing and Urban Development (HUD) at Eskaton’s affordable living apartment communities. Professional on-site staff members provide support, activities, maintenance, security, and social service coordination in an independent setting. Eskaton Adult Day Health Center —Offers a day program, including nursing, personal care, social services, therapy and a vibrant activity program. This program provides respite for caregivers. 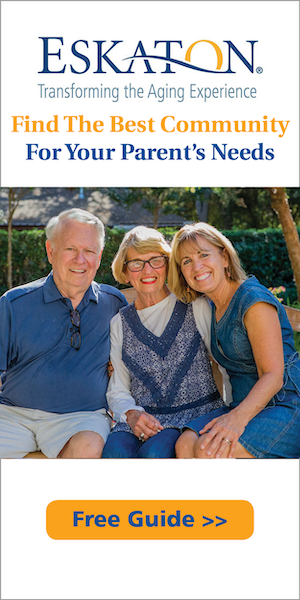 Eskaton Foundation — Supports the needs of seniors in the greater Sacramento area. Giving back to build a vital region is a cornerstone of Eskaton. Eskaton Home Healthcare — Offers a combination of clinical services, rehabilitation, education and encouragement in the comfort of one’s own home through our team of nurses, therapists and home health aides. Eskaton Telephone Reassurance — Trained volunteers provide free daily check-in calls to older adults who live alone or are isolated and would benefit from regular connection to our friendly network of volunteers. Livable Design — The Livable Design Seal of Approval program promotes innovative home designs with built-in function, flexibility and convenience to create beautiful living spaces for ever-changing lifestyles. Live Well at Home By Eskaton — Provides non-medical home care, ranging from basic companionship to comprehensive support and a specialized dementia-care program through well-trained, compassionate, insured and bonded caregivers. Available 24/7, Care Navigators provide assessments and help navigate families toward the right home care support. They also focus on supporting successful transitions for older adults and their families upon discharge from the hospital, rehabilitation or skilled nursing community. The Trousdale Wellness Center — Designed to meet the physical activity needs of older adults. Classes emphasizes gentle aerobic activity and strengthening exercises for upper and lower body muscle groups. In addition, class structure will include stretching and relaxation. Support and Management Services — Our team of professionals brings together experts in strategic planning, information technology, finance, operations, marketing, design and development which enables us the ability to provide each client and individualized support plan.